Isabel and Julian Bannerman have been described as ‘mavericks in the grand manner, touched by genius’ (Min Hogg, World of Interiors) and ‘the Bonnie and Clyde of garden design’ (Ruth Guilding, The Bible of British Taste). Their approach to design, while rooted in history and the classical tradition, is fresh, eclectic and surprising. Designers to the highest in the land, they have made gardens for the Prince of Wales at Highgrove, Lord Rothschild at Waddesdon Manor, the Duke and Duchess of Norfolk at Arundel Castle in Sussex, John Paul Getty II at Wormsley in Buckinghamshire, the great walled garden at Houghton, home of the Marquess of Cholmondeley, and they designed the British 9/11 Memorial Garden in New York. ‘Their work of grand architectural gestures, of mock ruins and oaken temples has made them famous. But it is the houses and gardens they have made for themselves that … eclipse any of these aristocratic delights’ (Mary Keen, Daily Telegraph). Their garden at Hanham Court near Bath was acclaimed by Gardens Illustrated as the top garden of 2009, ahead of Sissinghurst. When they moved from Hanham it was to the fairytale castle of Trematon overlooking Plymouth Sound, where they have created yet another magical garden. 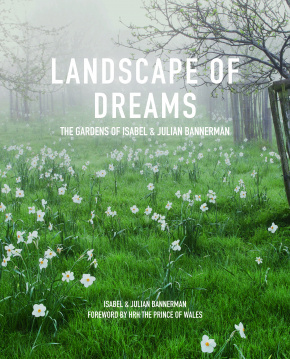 Landscape of Dreams celebrates, in the Bannerman’s inimitable, evocative, humorous and highly personal style, the imaginative and practical process of designing, making and planting all of these gardens, and many more. "This lavish book is a portal into a delightful escapist dreamworld. "We may live in a digital age but still there’s nothing quite like the enduring pleasures of a real gardening book. Among the best of this year’s crop is Landscape of Dreams, a lushly illustrated, beautifully-penned and instructive account of the work of this well-known UK garden design duo." "Prince Charles has contributed a glowing introduction to their lavishly illustrated book, Landscape of Dreams...fascinating." "Nobody makes magic like designer duo Julian and Isabel Bannerman, who have created fabulous, fanciful gardens at Highgrove, Waddesdon Manor and Arundel Castle. 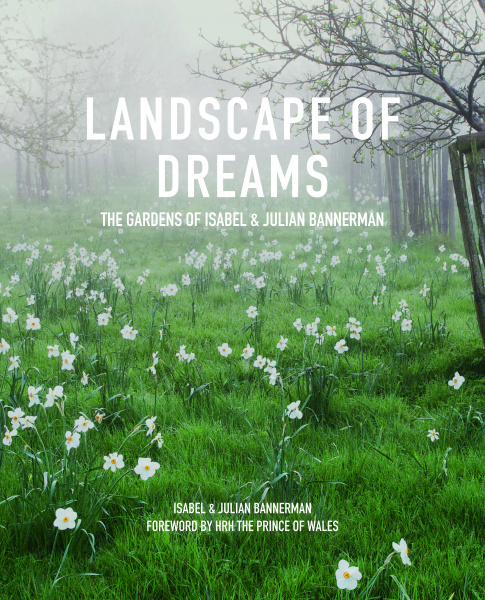 The couple’s weighty book, Landscape of Dreams, chronicles these gardens and more, and makes inspiring reading." "I just gorged myself on this magnificent book. Utterly transporting. It’s the first gardening book I couldn’t put down." "An amazing book from cover to beautiful cover...The descriptive writing is very compelling and fuels the imagination...It's a triumph and a revelation to the reader." "Isabel and Julian Bannerman have turned dreams to ethereal reality time and again. This is a glorious scrapbook-style story of some of their most notable works." "An absolutely magical book. Such brilliant writing, vivid, engaged . . . this is a most potent record of true brilliance." "Their style is very striking and fantastical...eye-opening browsing." "The Bannermans are artists but they can also write." "Weavers of garden fairy tales..."
"This book, a personal account of the couple's key design projects, builds up a picture, both in words and images, of what this special touch involves." "A beautifully illustrated and endearing part-biography, part-overview of the thinking behind their work..."
"A sense of fairy tale defines all [the Bannermans’] projects . . . Included in this book are their projects large and small, from their 1994 Gold Medal winning Chelsea garden to the Highgrove stumpery . . . culminating in their own much loved gardens at Hanham Court and, most recently, Trematon Castle in Cornwall. Beautifully written by Isabel, the book reads like a diary, beginning in their childhoods...Designed by their friend Dunstan Baker, the book is illustrated with their own photographs and drawings, giving it a personal, intimate appeal." "Character oozes through every pore of the book." "Full of wonderful photographs - but do read the writing from the beginning: it's romantic, thoughtful and inspiring." "This glorious book is not only beautiful to look at, it is written in wonderfully descriptive language. I found my head filled with ideas as well as thoughts about what gardening is all about." "Gloriously illustrated...displays their touches of genius everywhere. The book is ostensibly about gardens, or garden designs, but it is so much more than that. It's about passion, vision, commitment and entertainment, and it's also a glorious celebration of England." “A record of the grand scale gardens made by these two offbeat visionaries . . . a compelling read." "Packed with sumptuous images of their quirky, stately and inventive British gardens which although largely grand are nonetheless really inspiring."